Comparing climbing grades is a serious topic :-) A V4 boulder problem is typically 6b or harder which equals a 5.10c YDS but it is really hard to compare because being able to perform V4 complexity moves doesn't mean you have the endurance to master a full pitch of such problems.. Thanks for posting this, was looking for some such scale, yours was one of the first hits. Exactly what I wanted. Wikipedia, my first resource, failed me here. Bouldering in the gym my whole life, rarely go outside. 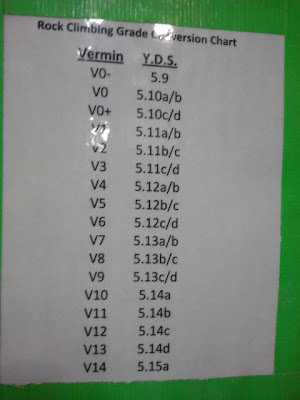 I often forget what difficulty I climb in the YDS scale. @Thomas Graf, V4 is not 10c. I can comfortably lead 10c, but can only occasionally solve the V4's I find. You've made the mistake of thinking that 6B French is the same as 6B Font and thus the same as 5.10c YDS. Fontainebleau and French are not interchangeable.